Teaching with Grace: What's your favorite? #3: Just list, link, and use pictures! #1- Pin it! My pin it button was one of the first added so that I can pin to my pinterest boards! #2- Making Learning Fun- This site is AH-mazing for finding activities to go with any theme or major book! ( I just tried to zoom out to take a picture of the list of themes... I got to 25% zoom out and it still wasn't enough to get it all on!) It is simply the best resource and it is so, so organized!! 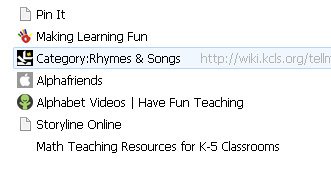 #3-Category:Rhymes and Songs- This is an AWESOME site. I actually was given this one by our local library. If you ever go to story time, this is the place that they get pretty much all of their songs and rhymes. Plus they have videos to go with almost everything! #4- This is a must have resource for my Kindergarten class at the beginning of the year. 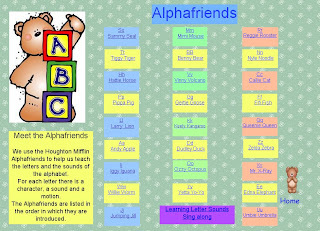 We use a program called Alphafriends. It's a cute little program where each letter is a 'friend' and has their own motion and their own song. This site links to the perfect website that has all the songs ready for you! #5- Have Fun Teaching! I swear that this man is a genius! I use his letter videos on a DAILY basis y'all! They are fun, upbeat, engaging, and AWESOME! My kiddos love, love, love him! He has so many resources on his site from songs to videos to centers to activities. It just keeps going! #6- Storyline Online- The Screen Actors Guild Foundation has put together this AH-mazing site to promote literacy. There are famous actors who read children's stories to them. Closed captioning is even an option so you can use it promote left to right with reading fundamentals. They have great stories like A Bad Case of Stripes read by Sean Astin (a.k.a- Rudy or Frodo). #7- Math Teaching Resources K-5- With the common core upon us and the 'unpacking' that has to be done, this website is an absolute GEM! They look at each grade level K-5 and break it down by Domain and then by standard. The activities are typically ready-to-print or require very little prep. 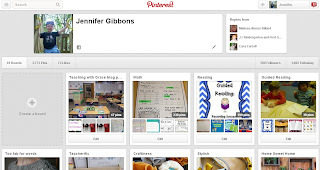 It is my go to resource for lots and lots of activities! I sure hope that you enjoy checking out these new sites! They are my favorites by far and use them daily! I'd love to see your favorite sites too! Link up below and make sure to share some love with the link before you and the link behind yours. We all love comments! Grab the button and share away!